The Puget Sound region is the economic center of Washington. American settlement began in the 1840's, working gradually north from the Oregon Territory and establishing communities along the shores of Puget Sound, beginning with Tumwater and soon extending to Seattle and beyond. 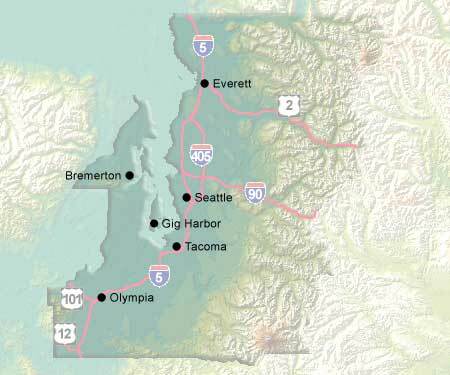 The region is considered to extend to the crest of the Cascades on the east and includes Kitsap Peninsula on west. Thurston County, containing the state capital Olympia, represents the southern edge. Many people use the term "Puget Sound" to include the waters all the way to Canada, but north of Whidbey Island is not properly part of Puget Sound. The other major cities are Tacoma, Everett, Bellevue, and Federal Way.